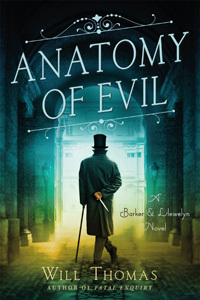 Anatomy of Evil by Will Thomas: Synopsis and Online Purchase Options. Synopsis (from the publisher): Cyrus Barker is undoubtedly England's premiere private enquiry agent. With the help of his assistant Thomas Llewelyn, he's developed an enviable reputation for discreetly solving some of the toughest, most consequential cases in recent history. But one evening in 1888, Robert Anderson, the head of Scotland Yard's Criminal Investigation Department (CID), appears at Barker's office with an offer. A series of murders in the Whitechapel area of London are turning the city upside down, with tremendous pressure being brought to bear on Scotland Yard and the government itself. Barker is to be named temporary envoy to the Royal Family with regard to the case while surreptitiously bringing his investigative skill to the case. With various elements of society, high and low, bringing their own agenda to increasingly shocking murders, Barker and Llewellyn must find and hunt down the century's most notorious killer. The Whitechapel Killer has managed to elude the finest minds of Scotland Yard — and beyond — he's never faced a mind as nimble and a man as skilled as Cyrus Barker. But even Barker's prodigious skills may not be enough to track down a killer in time.